As the release date of Anno 1800 draws closer, we are in the final sprints to polish and balance the game. Creating the DevBlog takes a lot of time and much of the games content has been highlighted in some shape or form already, the game developer insights will take a short break this week. 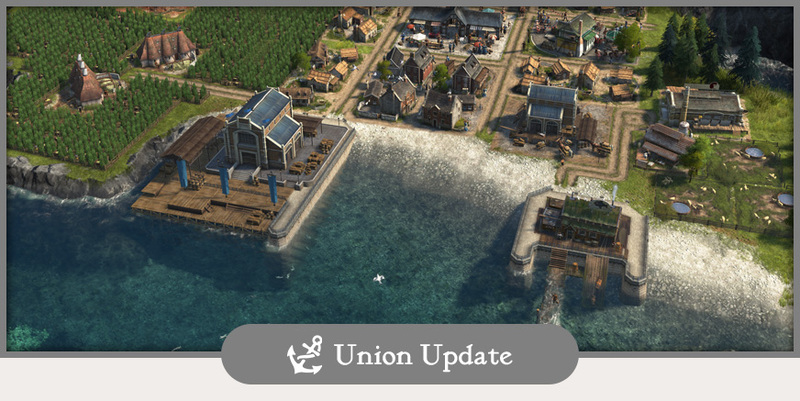 We brought you dozens of DevBlogs since launch of the Anno Union in 2017 and we still have some articles in our pocket leading up to the launch of the game. 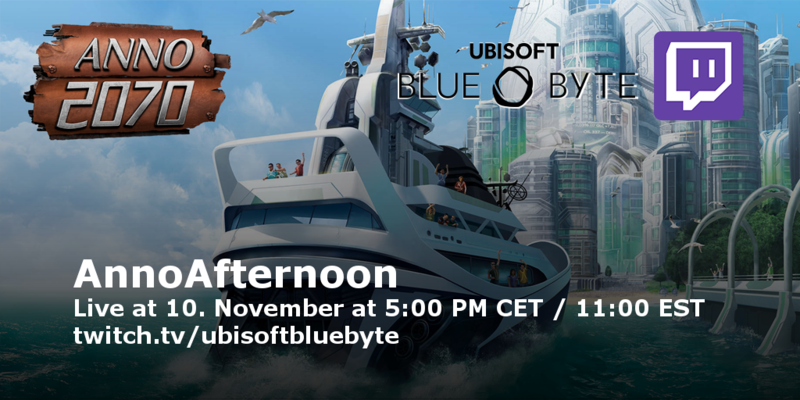 But we won’t be lazy as we will ramp up the amount of Anno 1800 live-streams on our twitch channel with the AnnoAfternoon stream returning this week and the Community Corner coming back in the week ahead with a German episode including a special guest. 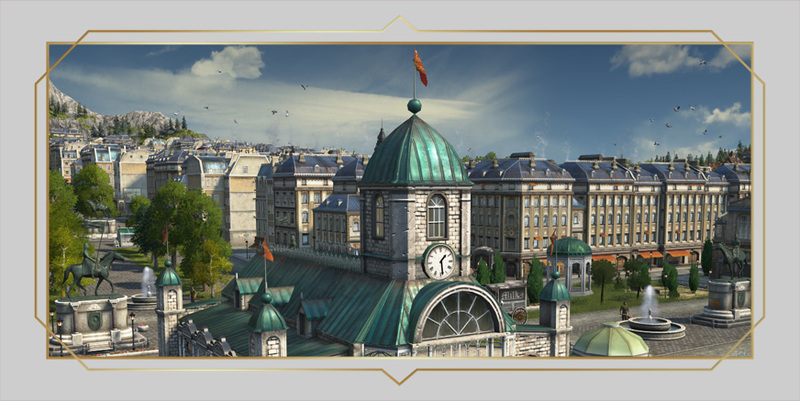 It’s time once more for our Community team takes you on another Anno 1800 Twitch adventure! 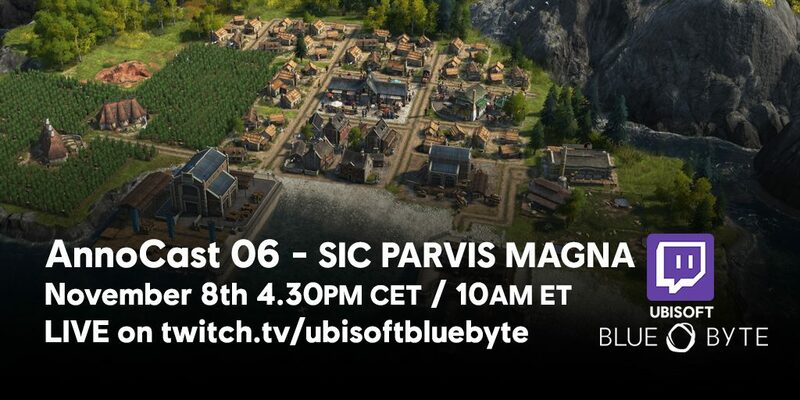 In the next episode of our AnnoAfternoon community stream, we will venture forth into the new world together, when we listen to your suggestions as to how we should build and name our cities. Last but not least, we have prepared some answers to your most burning multiplayer questions in today’s community Q&A. When we add friends from our friends list. Does this include the Steam friend list and Uplay? Or do you have to find your friends in the game, and add them to your friends list? I’d really like to know if this does link to friends lists in Steam, and Uplay. Answer: Anno lists steam friends as well as your Uplay friends. In case you invite someone from you friend list, Anno does automatically select the right backend (Steam or UPlay) for the invitation and also receive and handle the invitations from both systems. We did find that once we had expanded into the new world we had to give up due to constant desync’s. As we are all on fibre and all in the same country (New Zealand) could this have been caused by the need to communicate with the host server where ever that is located or was it a known issue that has been worked out in these final weeks? Answer: We identified and fixed many reasons for de-synchs thanks to the great participation of Closed Beta. This also includes many de-syncs related to the South America session. It is not very likely, that your desynch problems as described where caused by network issues, as because Anno tries to keep the connections “as local” as possible. Only if the NATs of the participants are not compatible, we are forced to route the traffic over Ubisoft servers to enable the players to join. But this also can be resolved by players by adding Anno to the exception list of your router. I would be interested in a whole Devblog about the topic synchronization. Which kind of data is exactly synchronized? How is the system checking if there are disparities between the different computers and how does that coherent with the simulation of the game? Answer: Simply speaking, every single player action will get recorded and synchronized before the system shares all input data of for the simulation with every other participating player (every PC in the session calculates all steps of the simulation for every player in the match). Does that mean that saved multiplayer matched can be continued with different players? That would mean it would be possible to create a staged savegame with already established cities instead of an empty map. Answer: You are able to continue mutliplayer savegames even if the original players are not available anymore. When new players join, they can “overtake” an empire and continue to progress and expand with that game state. While it is technically possible to create scenarios that way, you would need to have a dedicated player for every single party as you cannot take control over two or more empires. I would love to see that you could also do a search for players based on language and region to make it easier to communicate with the other players. Answer: When looking for a player, our matchmaking takes the region as well as language into account. Should the system be unable to find a player after a while, it will expand the search for players with the same language across the globe. If the system is still unable to match you with someone, it will also widen the search to global players with any language. Yo ho! This week we’ll feature not one but two streams, our game development show AnnoCast as well as our community favorite AnnoAfternoon. Last week, we’ve shown off our two Pirate captains, Anne Harlow and Jean La Fortune. We were especially happy to see some of the feedback we’ve gotten to their island designs and that you like their stories. Mind you, these will not be the last of the NPCs you’ll get to see! Furthermore, the blog has shown that many of you are curious about the various possibilities to interact with the different AI characters of the game. A diplomacy blog is currently in the making and will shed some light on the various interactions with future to be enemies, allies or trading partners. Without further ado, here comes this week’s streaming schedule. You can find the Events with their times also listed on Twitch by clicking the links, which allows you to set up a reminder when the streams are about to start. In the next episode of our Anno 1800 stream, we will start a completely new settlement, from our first farm houses to the technical marvels of the first industrial revolution. This week, we will not have a QnA in this blog due to the stream, though you will have the opportunity to ask us questions live during the stream. So what are you waiting for? Let us know your most burning questions in the comments below and we make sure that we take some time during the show to bring you the answers! This week, John from the Community Team will fly (swim? sail?) solo on this week’s AnnoAfternoon and continue where he left off two weeks ago. For those who might have missed it: The AnnoAfternoon is now every second and fourth week of a month. We hope to see the first underwater settlement in the game by the end of this stream and maybe someone will finally show Hector that we have the strongest navy. Many Annoholics count the days until February 26th. Bambierfurt goes one step further and brings you interesting Annofacts daily. KatherineOfSky, or KoS, loves to play building games and recently created a Anno 2070 Multiplayer Tutorial, which might even teach Anno 2070 veterans something new. You like the Anno Union but you don’t have the time to read it all? 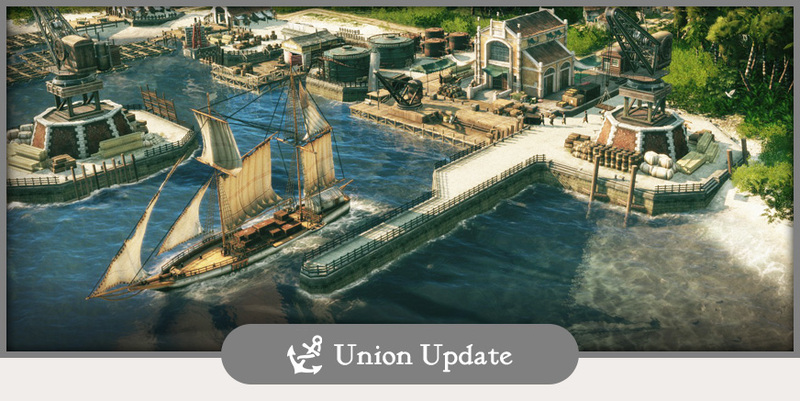 RhetioTV is not only giving you an overview of the latest Anno Union Blogs, but doesn’t shy away from speculating a bit. Those were just a few examples of what we liked this week. But let us turn this around now and ask you, what Anno-related content you like to check out, when you’re not building cities yourself? Do you prefer to watch a livestream? Have an Anno-blogger you follow? Someone who makes really good Anno-memes that make you smile? Let us know down in the comments and we hope to see you tomorrow and on Saturday! 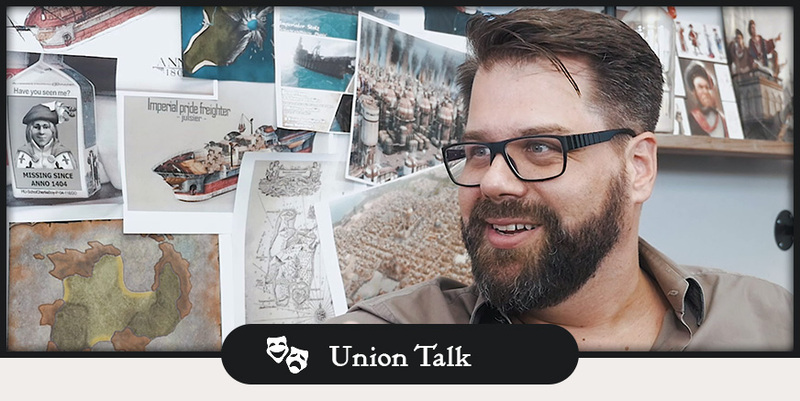 Today, we want to present you our first Union Talk, where we sit together to talk about Anno Union relevant community topics. With our big reveal in 2017, we invited Anno fans around the world to share feedback to help us developing Anno 1800. Thousands of comments and 120 blogs later, how has the community actually changed the game for the better? Our Creative Director Dirk “Karrenschieber” Riegert will give you some insights how your comments and participation helped to shape the New World and other important game content. Let us know if you liked the idea of our Union Talk, is that something you would love to see more in future and topics you would like to see tackled in the next episode? Before we handle the needs of our residents in this weeks DevBlog: Happiness, we will tackle some community questions in todays Union Update. I have a question coming from how other building games do it. I cannot recall Anno games ever having some kind of maintenance mechanics for buildings, such as that they wear off after a while and have to be repaired. How is it with 1800? Do we need to maintain buildings in order to keep the production going? Answer: Buildings will not wear themselves out from usage and therefore there is no need to perform any maintenance actions. However, incidents such as fire can damage buildings, which will regenerate over time. Ruins on the other hand, have to be manually refurbed by the player. When it comes to harbor defense, repair cranes serve as a measure to maintain your damaged defense structures. While the idea of a maintenance mechanic for buildings sounds interesting for the early game, it would have an extremely heavy micro-management impact in the mid- and late-game. In Anno, you construct not only hundreds or even thousands of buildings across multiple islands and sessions, you also have to take care of trading routes, your fleets and to manage complex logistical networks. What if I spent all my influence on a big fleet of ships and then want to change my strategy to use a ton of items or settle on many different islands? Answer: That depends on the size of your empire, as the amount of influence points is bound to your population. Even if you spend enough points on one category to benefit from the bigger global buff, you will have still some influence at your disposal to invest in other categories. You can also downsize your fleet to reinvest the points in different categories. The military category will allow building fleets at a size and scope previously unseen in an Anno title but a total focus on military won’t be necessary to build up a strong fleet. Does that mean that we will be restricted from the get go? We won’t be able to settle on an unlimited amount of islands and NEED to invest in the expansion category? 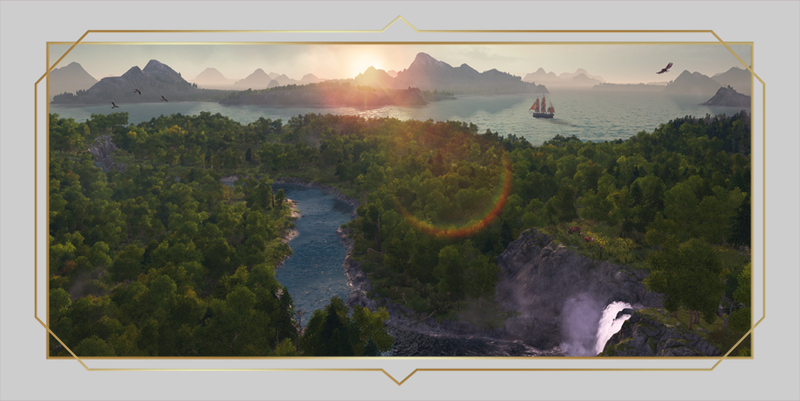 Answer: Players who like to steal islands away from AI or other players as fast as possible will need to invest in the expansion category in order to do so. Most players however won’t even need to spend any influence in the beginning, unless they pursue a rush strategy at the start of the game. This way, during the early game influence is especially relevant for players who want to fully commit to a certain playstyle, such as expanding quickly in all directions or to rush a production pipeline to have a large fleet of battle ships as early as possible. When it comes to the “Expansion”category, there is something you have to keep in mind: additional islands will automatically generate influence alongside your growing population (unless you are just claiming new land without establishing settlements). If you just establish a few production islands, you won’t need to spent much (or even any) influence at all but if you want to prevent other parties from expanding, you will need to invest. Players who want to build huge empires don’t need to worry, as influence has no upper limit and will grow together with your empire and its number of inhabitants. Is it correct that gramophones are produced by engineers? It makes sense to a degree, but will investors even provide any form of workforce? I also think that it would make more sense that the artisans create the ornaments for the gramophones, instead of the engineers. Answer: Not all production chains are final yet, as we are still working on balancing, which is also affected by feedback from our focus test groups. It is also important that we find a good distribution of all workforce, in order to ensure that each residential tier is equally relevant, and remains so even in later stages. If we notice that we ask for too many engineers in one production tier while artisans are being left out, we will sit together to find ways to have the workforce distributed more evenly. Since we started developing the game, we had to re-arrange and sometimes even completely change different production chains. But there is one overarching rule: the workforce from all residential tiers stays relevant throughout the whole game. Investors are different, as they will not provide a typical workforce for your production chains. However, the amount of investors available will play a role when organizing events that are hosted at the world fair. Will there be a Beta phase for final polishing and bugfixing? Answer: In order to improve the game, we will continue to make use of our Union focus test program, but also have larger scale testing phases with a lot more players later on. I would really like to see that every residential tier would get their own enhanced version of the basic kontor. IN the tradition of Anno 1602, it would be great if the enhanced kontor would be available as a project from your construction menu instead of upgrading automatically. Answer: While the kontor will not automatically upgrade with every new residential tier, you will be able to upgrade every kontor as well as you warehouses in several stages. 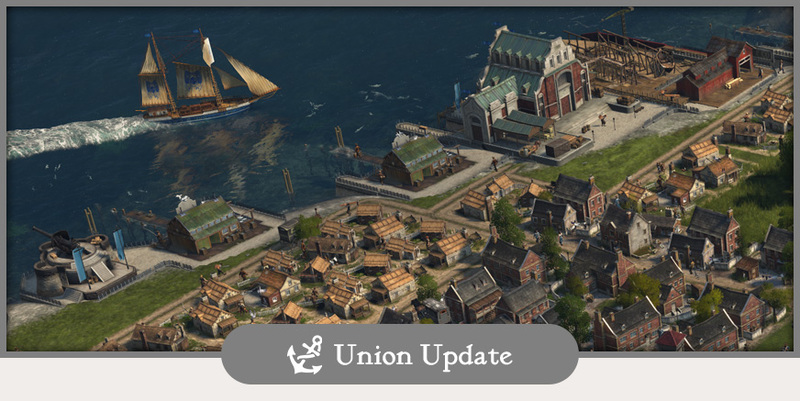 Welcome back to our regular Union Update, as the last week has been quite busy bringing Anno 1800 to the PC Gaming Show in Los Angeles. However, before we dive into the news, let us talk about upcoming Union content. This week, we will reveal the last residential tier of Anno 1800. The 19th century was not only a time of progress; it was also the time of big business, from old aristocrats to soldier of fortune trying to build the next big company. New production chains will be challenging and exciting alike and as mentioned in our last Q&A, the last tier will unlock interesting end-game content. After that, it is time for the anniversary of one of the most influential Anno games of all times: Anno 1404. After the anniversary content, you can look forward to blogs that will tackle the technological marvels of the 19th century. On that note, we are still looking for any 1404 anecdotes from our community. If you have a special, funny or just awesome 1404 moment to share, let us know in the comments below! Last week, Anno 1800’s Executive Producer Burkhard and Community Developer Bastian traveled to Los Angeles to present our game during the PC Gaming Show. To show the game to PC players and strategy fans out there, we revealed our new trailer, kicked off a new Anno Union vote as well as talked about the game, setting and why community feedback matters. However, the PC Gaming Show was only the beginning, as we are looking forward to see Anno Union members and Anno fans at this year’s gamescom 2018. The next community roundtable is happening! 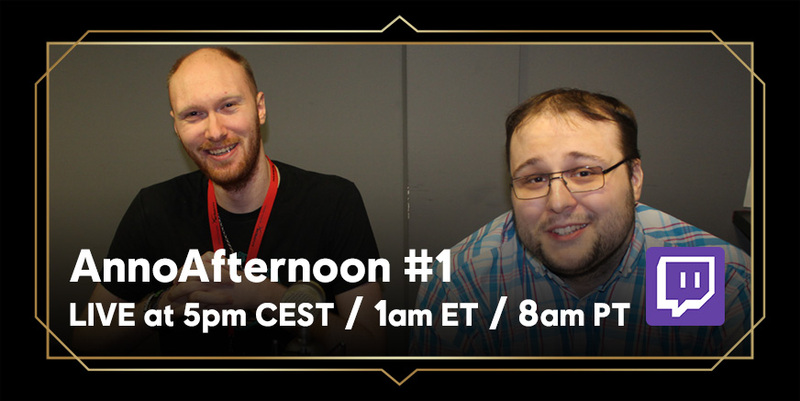 Meet our community developer and members of our community team to chat about anything Anno 1800 and Anno Union related. Our Annoverse Fan-Discord will host the roundtable session, in which you can join, ask us questions, discuss or just listen to the ongoing conversation. We use Voice Chat to communicate during the roundtable, but you can also ask questions in the chat if you don’t have or want to use a microphone. We will share some further details with the next Union Update. Many of you mentioned that they would love to get their hands on every ship and we heard you. We will make sure that you can get the hands of most, if not all, of the special ships via gameplay. While you will not be able to build them in your shipyard, there will be different ways to acquire the ships when playing, if it will be from third party NPC’s or via other features. Do not worry about the variety of ships you can construct, they will cover a lot from sail to steamships and we will share some details when we highlight the while Naval system in a future Union blog. With the current vote, we want not only to get insights which ship is your favorite (and especially why from gathering your comments), it will decide for which ship we will create a second variant designed by the Anno Union itself. Do not worry about the missing details; we will share some examples and details when the contest starts. Next focus test has already started! The next round of our Anno Union focus tests is currently live. We invited a new group with over a dozen Anno Union members to test Anno 1800 inside out while providing daily reports to the development team. If you did not make it into this round, do not worry, we will continue the focus test program throughout the year and will invite bigger groups of players later on. We heard your feedback that you want more details on what and how focus tests affected the development of Anno 1800. When the current focus test round concludes, we will provide you with a more detailed update about our insights and findings from this session. 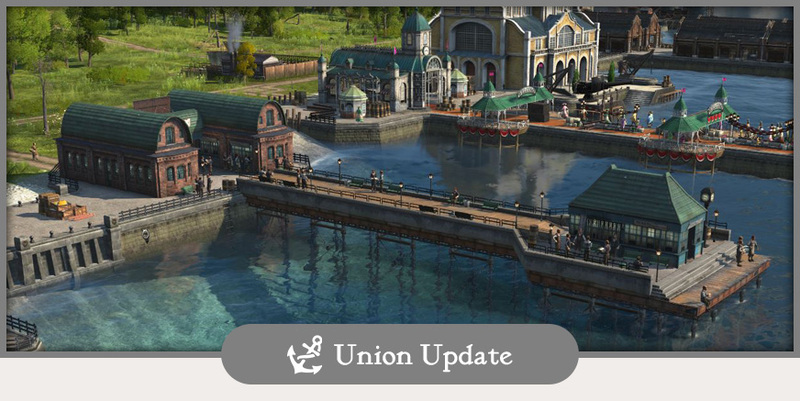 As always, our “player stories” are a combination between Anno Union blog feedback, discussions in our forum and fan groups as well as detailed feedback from our focus groups. Union Update: Next vote ahead! For the first Union Update for the month of June, we want to share some details about upcoming Union content. 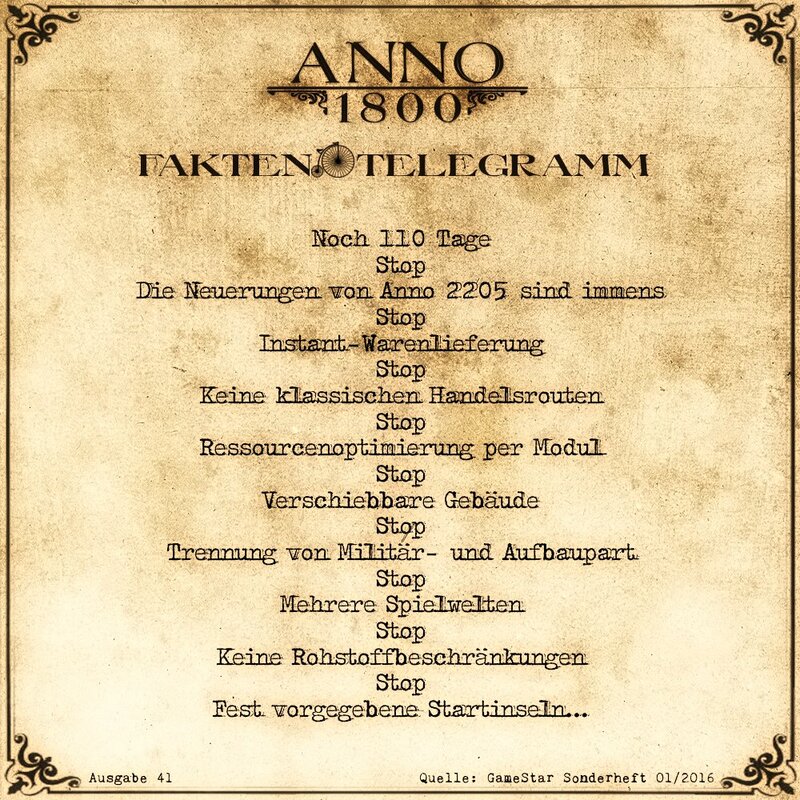 During the last episode of our AnnoCast, we were able to present you Anno 1800’s UI design. From design to functionality, many of you shared their feedback and questions and our UI Design team would like to invite you this week to give you exclusive insights into their design and thought process. Next week will be a little bit different, as we won’t have a classic DevBlog or Union Update. However, we have something exciting up our sleeves: the first stage of our next Union vote! We don’t want to leave you fully in the dark, of course, so we can tease that it has something to do with ships and will give you some interesting insights about another third party character in Anno 1800. Beyond that, you can also expect some new anniversary content for one of the most beloved Anno games in June. Can you believe that it has been 9 years already since 1404 set sail for the first time? Let us see what kind of fond memories and old anecdotes we can gather from our team. And as always we want to hear from you! What are your personal best Anno 1404 moments, anecdotes or funny stories you remember? With the engineer’s blog, we moved from the early years of the industrial era to the second wave of the revolution. Naturally, we want to highlight some of the wonders of that time, when the old age passed the torch to a new era. Finally, you can expect the reveal of the fifth and last residential tier as well. Before we head over to today’s community Q&A, we have one more update for you. We plan to bring you the second community roundtable at the end of this month, this time with two different sessions for our International and German community. The roundtable is an event where we invite everyone from our community to an Anno Union voice chat session to talk about the Union, the game and its fans. We will share the exact details and dates with you soon! Will you be scattering little easter eggs across 1800 like you did in previous games? Answer: Some of you folks have a keen eye and were able to spot some easter eggs already. Our developers love to sneak smaller and bigger details and easter eggs into the game. Fun fact: We do not even know how many of them will be in the game, as our developers themselves keep it secret. Will street networks be realistically simulated, so that pedestrians and carts can cause congestions? 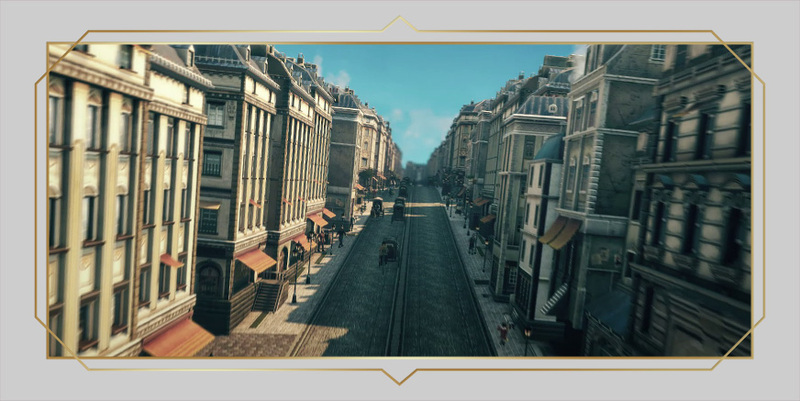 Answer: The distance travelled on your street network will play a role in the transport of goods in Anno 1800. Production buildings will calculate the most effective way to get goods either from another production building or from the warehouse. As goods are physically represented in the game world, transporting carts will need to queue up in front of your warehouse in order to load or unload the materials. This can, if your street and warehouse network is not optimized, lead to traffic jams in front of the loading/unloading areas. Will the attractiveness of a city affect the productivity of some buildings like in Anno 2070? Answer: Attractiveness itself will not affect the productivity of your industry. The new feature will support beauty builders with meaningful gameplay while also adding a new economic layer to the game. However, we do not want to force players, who want to concentrate on their industry, to use the city attractiveness if they don’t want to. Will it be possible to fast forward time like in 1404, so that the visuals and gameplay will run noticeably faster? (Anno 2205’s fast forward was too slow). Answer: You will be able to fast-forward the gameplay but the exact parameters are not final yet. With Anno, we always have to find a balance between comfort and usability. Especially with all the different gameplay loops of an Anno game, combined in a large game world and economic simulation, forwarding gameplay too fast would lead to issues. Think about all the things you need to keep track such as complex production chains, economic balance, AI behaviour of your opponents or potential city incidents. What I would love to see in an upcoming blog are some insights about the soundtrack of the game, if this kind of blog isn’t already in the works or even ready to go. The music in Anno games was for me, especially in the older titles, one of the important factors, which pushed the game experience. Answer: We are aware that you folks love the Anno music and are curious how we design and create sounds for an Anno game. We are currently working on DevBlogs related to audio design and soundtrack but these blogs take some preparation time. Will tourists just come out of nothing or arriving from different islands? Will it be possible to make use of a sea blockade to cut your opponent off from tourist ships? 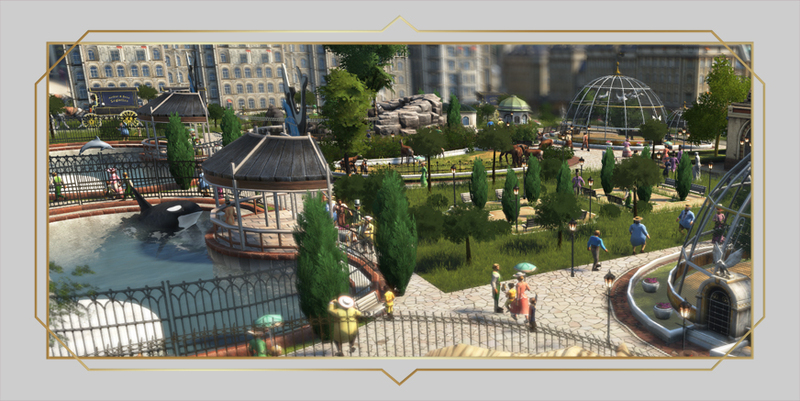 Answer: Tourist ships will enter the map and then travel around the session, stopping at any visitor harbour on the map and drop visitors based on the specific attractiveness level of a city. There will be ways to affect the tourism of an opponent’s island, keep an eye on the Union for future details. I would like to raise something based on the previous gameplay tours through the cityscape of the game. The small people, which run around the various places, are comically huge in the farthest zoom level. I mean sure, you want to be able to identify them but it would make more sense and help the atmosphere if the residents would be small. Answer: The not realistic proportions in Anno are a deliberate choice, as visual feedback units are not only an important part of the atmosphere; they play an important part in the readability of the game. On one side, you want that the game gives you the feeling of creating a lively city, on the other side need players to be able to get important basic game information when observing feedback units. However, the current ratios are not final yet and we got a lot of feedback from the community. Rest assured that we will modify the proportions to be more in line with the classic Anno appearance you are familiar with.